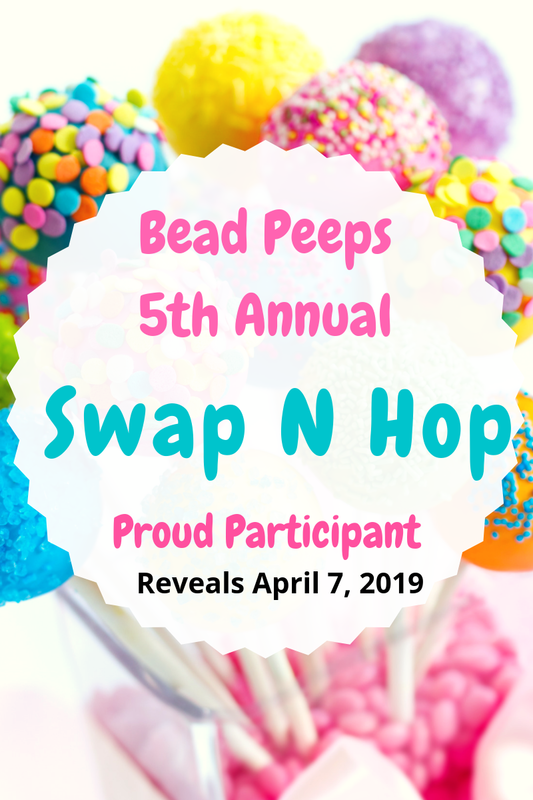 From the Bead Board : BEAD SOUP REVEAL!! Linda your wirework is wonderful. You should be proud of your designs. You did a great job. Love your selfies they made me laugh. Amazing designs Linda. Love your designs. First wrapping experience-really succesfull! And great 3-strand necklace! Super job. I literally gasped when I saw the first necklace. I love every piece you've made. Sounds like we had some similar challenges :-). Thanks for the morning chuckle! Beautiful necklace! You definitely rose up to the challenge. Great job! hahahah..... lovely pictures, my dear :0)))) You did a great job, my dear - I'm sure you had a lot of fun! WOOOWWWZZZAAA! So beautiful and creative, partner. Now I wish I had been more creative. I love both pieces so much. 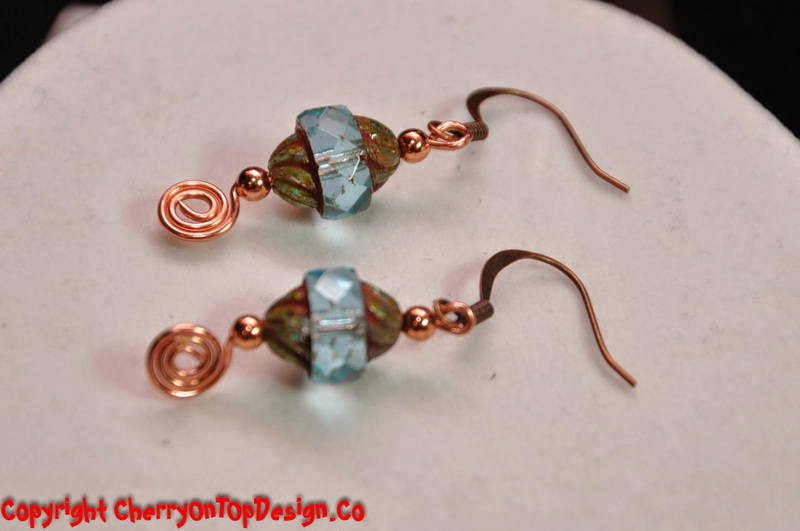 The wire wrapping is great and the copper flowers are amazing. You rose above any challenge that you might have felt you had. Great soup and thanks so much for the kind comment on mine. Talk with you later, friend. You without a doubt did your partner proud. And I love both necklaces. Mirroring that clasp with your metal design was inspired. And the selfies, well I have to say with your sense of humor I will be back to this blog for sure. Loving the color! That first necklace is great but I have a thing for owls so I am totally enamored of that one. Nice work! oh my gosh, of course I love what you created, they're all gorgeous! But most of all I love your selfies of you wearing them!! You're a cool chick! Holy cow, you should be SUPER proud! That first necklace is amazing! And I never would have guess the owl pendant was your first foray into wire wrapping! So glad you had fun! I have a thing for owl... so I love Owlivina. I love how you faced the challenge of scale head on. Great job! I love them all. The owl is devine. It really looks like you had fun. Absolutely stunning pieces and the pictures of you modelling them are fantastic! Soo much fun!! 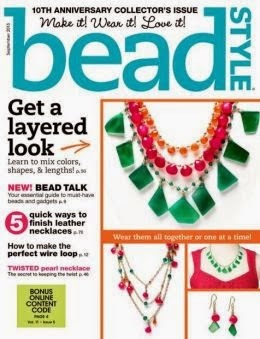 I love all the pieces - especially the colorful fun of the multi-strand necklace (and really loved the model!) Thanks for sharing! I love your selfies with your spectacular pieces! I love both of your necklaces and I think you did a fantastic job! Wonderful work! Wow your necklaces are wonderful! Very special necklace +. The selfies are simply a delight. 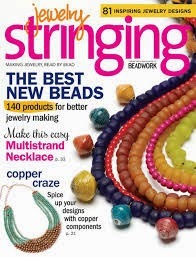 Your necklaces are beautiful, I love all the colors on the multi strand one and they are even more beautiful worn! Your pieces are beautiful!! You should feel very proud!! Gorgeous work! I especially love the triple strand necklace. I love your selfies! 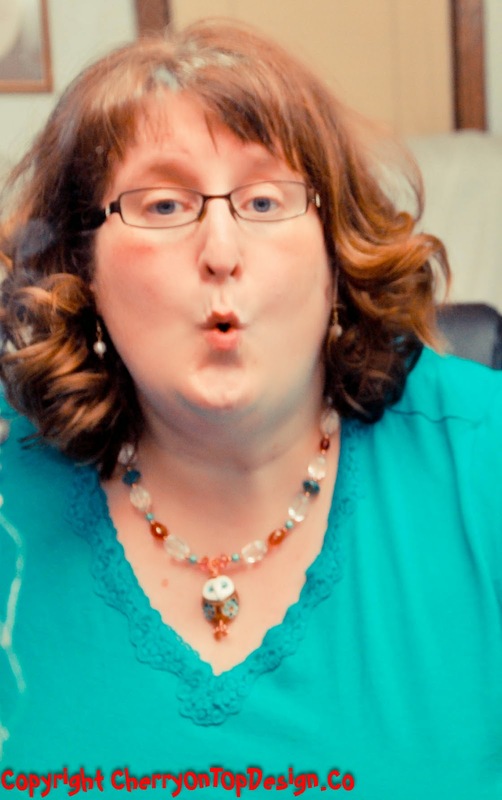 Especially the fishface (giggle). Oh, you definitely did your partner proud with these creations! 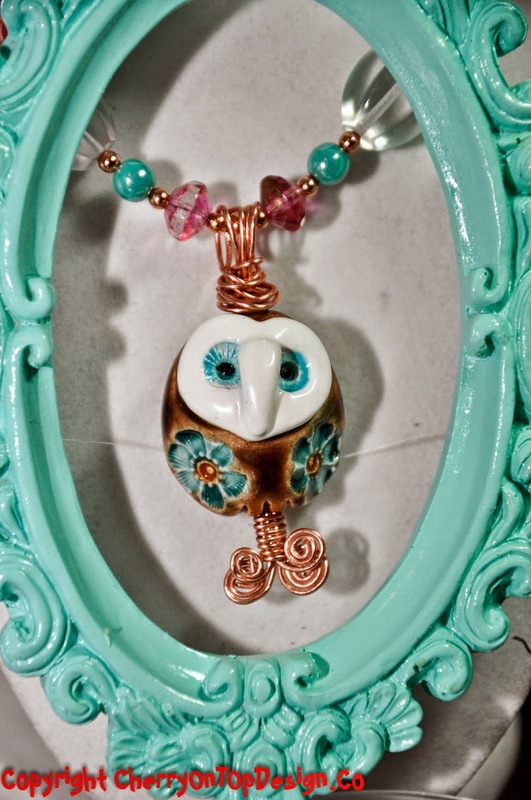 The copper flower is the perfect balance to the blue clasp, and Owlivia is adorable. Great work! You should be proud! Both necklaces are fantastic, but I especially like how you balanced out the clasp with the copper wire flower in the first necklace. It's stunning! I love your colorful design, specially the owl one. Great selfies, I almost forgot to look @ your work :-) No, just kidding, I saw them first, before scrolling. You must have had a lot of fun creating those beautiful pieces! I love the first necklace, but the second one is also beautiful! Love the first necklace, especially the interaction between the enemaled clasp and the copper connector. Thats really great! You certainly met the challenge. All you jewelry turned out terrific. I'm partial to the owlette, however. Linda!!! I loved visiting you! If only all of us had modeled our jewelry! You are something else! Incidentally, your sense of color has me totally floored. however I am sure you hear that all the time. You are a terrific designer! Love that little owl and how you presented it. Cute Selfies. You've created some beautiful pieces with your soup. I love how you used the bold flower clasp in front - Cheers! ok, you seem to be a very fun gal! I love your pieces! that owl was so cute. I love that first necklace with all the strands. you did a GREAT job! Your are so funny! I love the shots of you with the necklaces on! Each piece totally seems to reflect your personality! FUN! Soup-er job! You did a great job with your wire wrapping-loved your necklaces and your " selfie's"! You should be proud. These pieces are beautiful! I love the flower you made for both of the necklaces. Plus, "Owlivia" - how cute is that? I Really enjoyed looking at all the things you made with your soup, the first necklace is lovely and so colourful you got the adjustment of the strands nicely! cute earrings and I have to just love the owl necklace its so cute. I like all of your works ... the beautiful wire flowers necklace and earrings are my fav! Um....I especially love your selfie photo shoot:). You are adorable! best soup photos ever :-) love the necklace worns as head ornament, we sohuld od that more often! ha! you make me laugh! my fav is the first necklace....full of color and beauty! that sweet little owl, how precious...i think you showed him off perfectly. beautiful pieces! And what an AWESOME job you did! Well you can hardly go wrong with a gorgeous soup like that right? Don't you love working with Czech glass now though!? 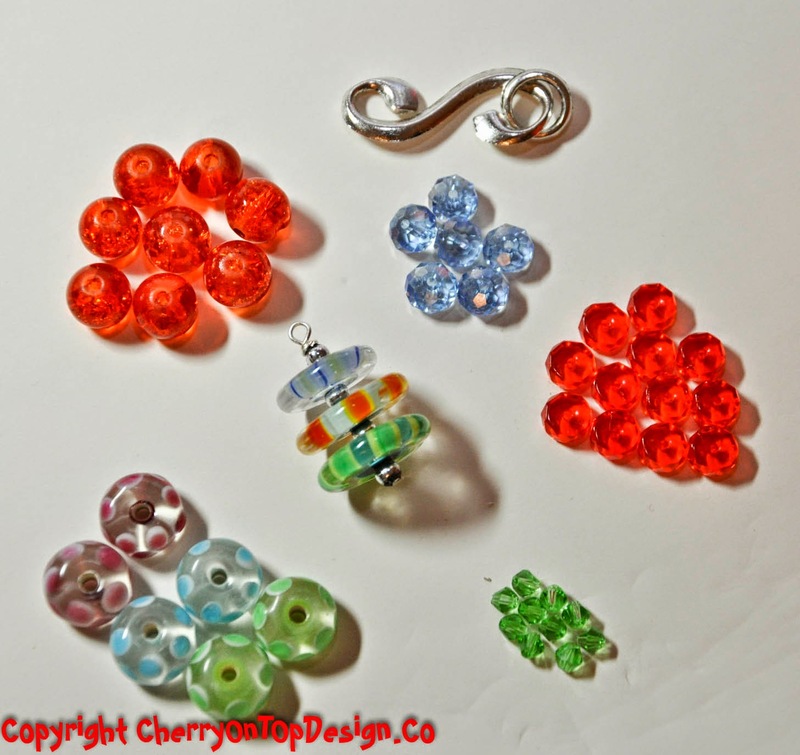 It is besides gems my favorite beads to work with!!! I positively love the photos of you and Owlivia having fun together. 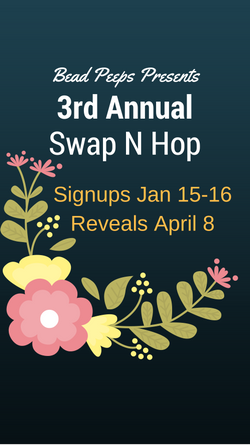 You made some beautiful designs and I especially admire those copper wire flowers you made to use throughout. Lovely. Your multi-strand is right up my alley. I loved it. Wow! Not inadequate at all! 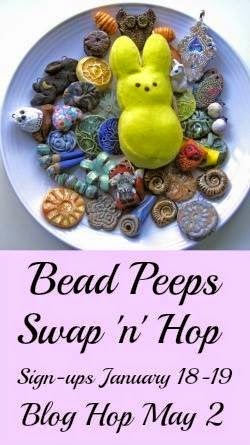 I love the multistrand piece but the way you wire wrapped the owl feet is just ingenious and adorable! 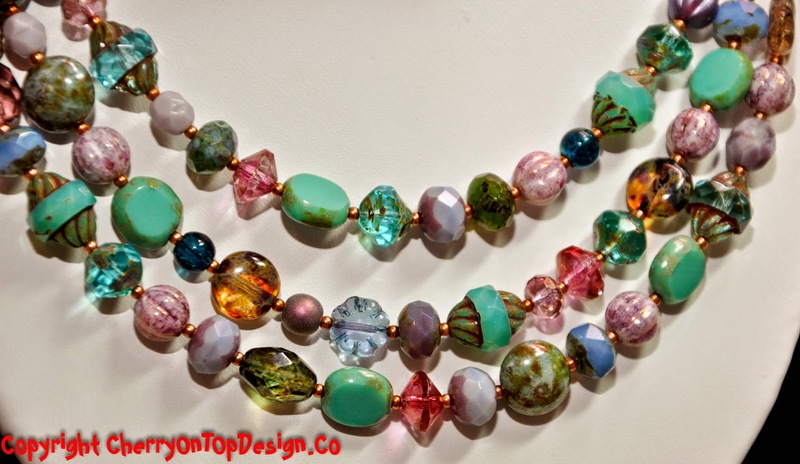 I especially like your first necklace design, graceful but fun! Love your sense of humor too! 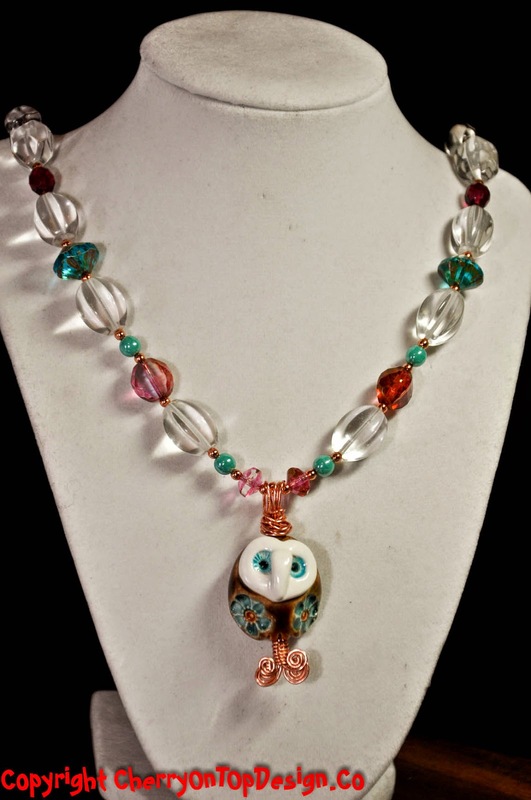 I love the multistrand but I love the owl necklace, too! Great photos :-D Thank you! i think you did fabulously with both your pieces. 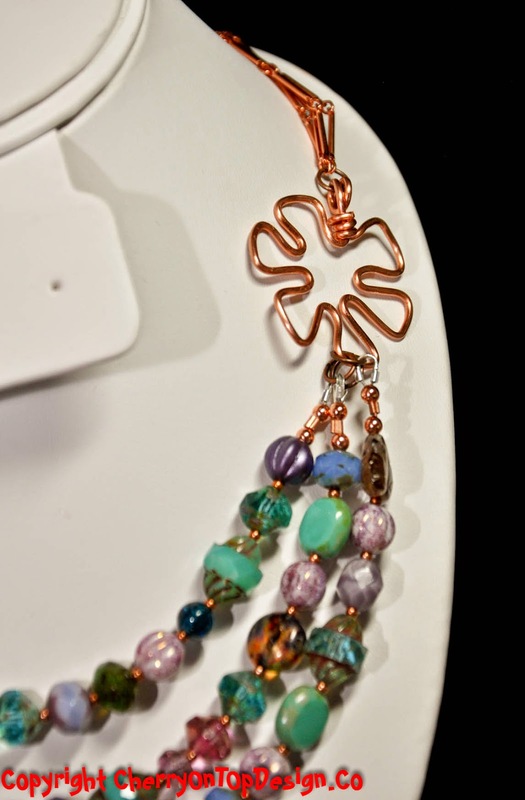 i also think the copper flower connectors add a great accent to the necklaces. i'm very proud of your accomplisments! and very creative designs too.. I love your works, great idea to make a flower shaped wire connector, and love the little owl necklace! You really made the best out a gorgeous but scary soup! I love all your pictures as well Owlivia, she is gorgeous. Excellent creations on your soup! Hey, don't think that the soup you sent was lacking! Remember, quality, not quantity! 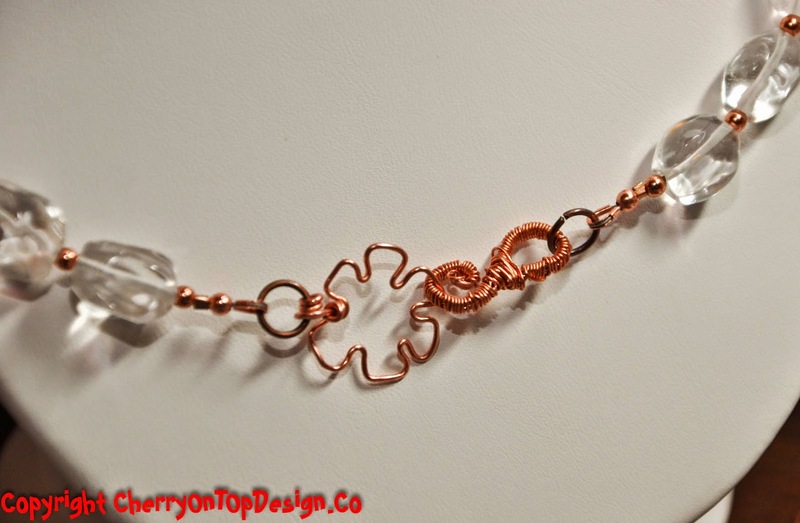 Love the flower you made to mirror the clasp...very creative and the whole pice is just beautiful! The owl focal is beautiful. I love your colors and designs. Loved your pieces and your selfies! Hahaha the selfies are great! But you'd never know you struggled at all with those beautiful necklaces!! Two were just the answer! And both perfect!! OH your pieces are wonderful and whimsical and delicious! And Owlivia is just the queen of it all! Fabulous!!!!!!! You are hilarious! 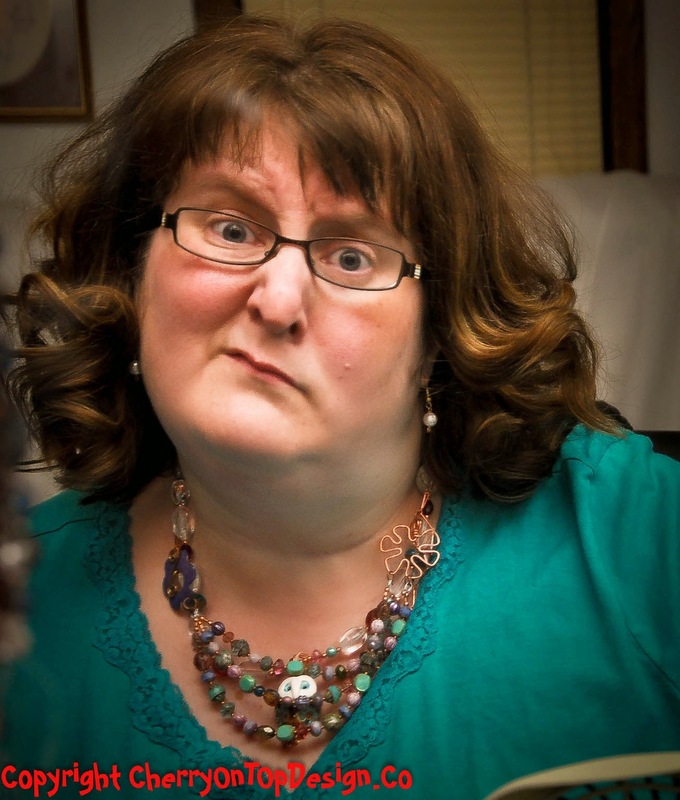 Thankyou for commenting on my blog so I could find yours! Dear Linda, You are so beautiful!!! I love Owlivia, I love her so much! The other neclase is also wonderful and Your selfless…smile… thanks for! I love the selfies, all the pieces are fantastik but the owl is my fave. I especially luv the wire flower elements in your design. Love that little owl! The selfies were fab! What a fun post!!! 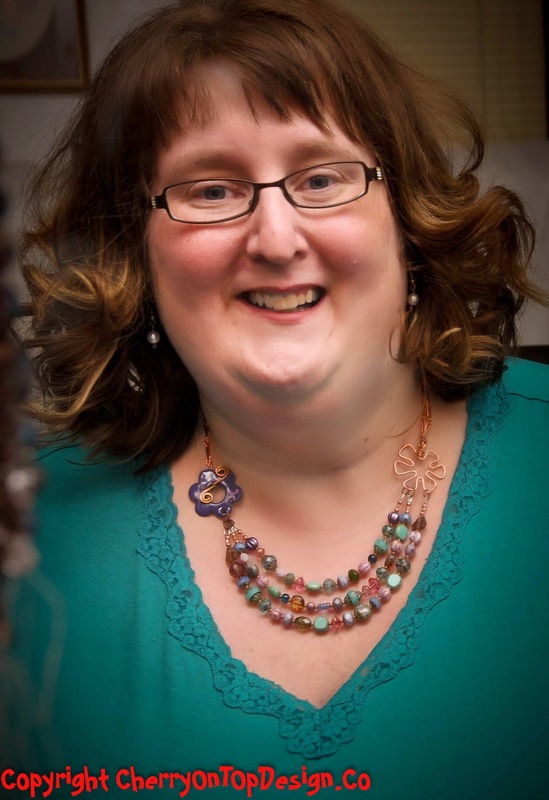 I love your first necklace - the colors of the three strands go perfectly together and love that wire flower you've made to counterbalance the clasp on the other side. That owl is too cute and the necklace very prety. Good job on your soup! You sure did Lori proud, no doubt about that! Oh that Owl is so cute! Wonderful soup and the necklace looks so good on too! I can't believe that you are just starting to work with wire. I think that you have found your new calling. Great job on both necklaces though my favorite is definitely the first one. Just love the flower connector. What a nice soup you were given. The owl focal is precious. Everything is quite pretty, and I especially like your first necklace. 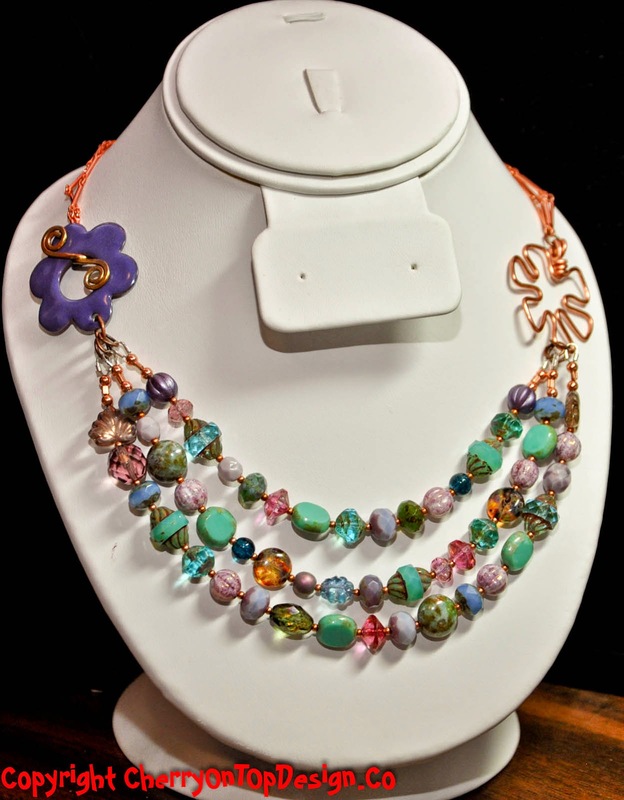 It is spring in a necklace - makes me think of Easter. Fantastic pieces...the owl is just my favorite! Nice job with your soup! You did an amazing Job!!! How fun! Loved Owlivia of course! I loved the triple strand as well! I think you should be very proud of yourself!!! Amazing Job!!! Have a Blessed Day!!! You really should be proud of those pieces, you did a great job! I love the owl necklace and earring you made with your soup. 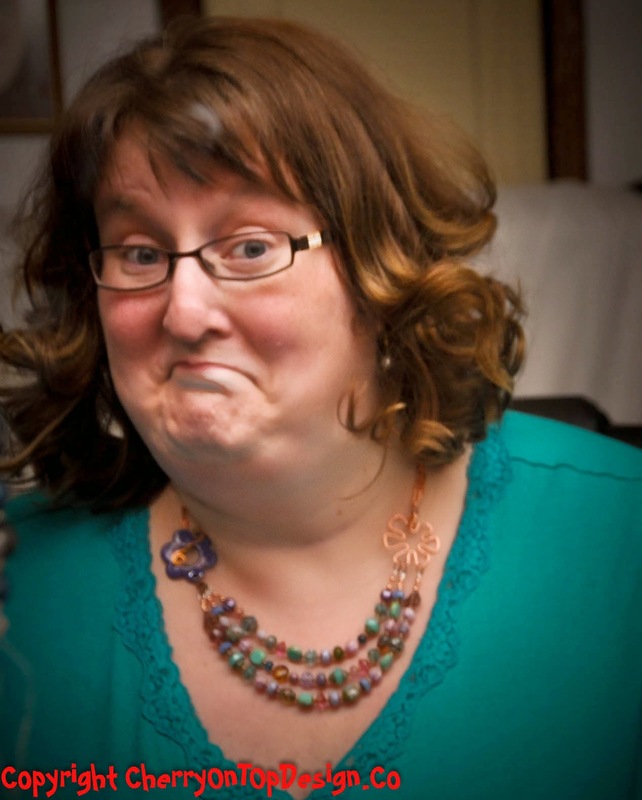 Your display pics were totally funny! Great job! Well done!!! Love your selfies!!! The three strand necklace is awesome!!! LOVE EVERYTHING ACTUALLY!!! What a great post, i love all your designs. Very beautiful! I love it... and I love the pictures of you. I can tell you had fun!! Good job!! I am absolutely crazy about the earrings! I would wear them a lot. Inferior HAH!!! You rocked it Linda! I love the owl focal your partner sent (and that you named her Owlivia)! Your flower connectors are brilliant...love everything you made! I have a feeling my stomach would hurt from laughing if I spent the day with you!! Gorgeous! The triple strand works so well with the clasp. 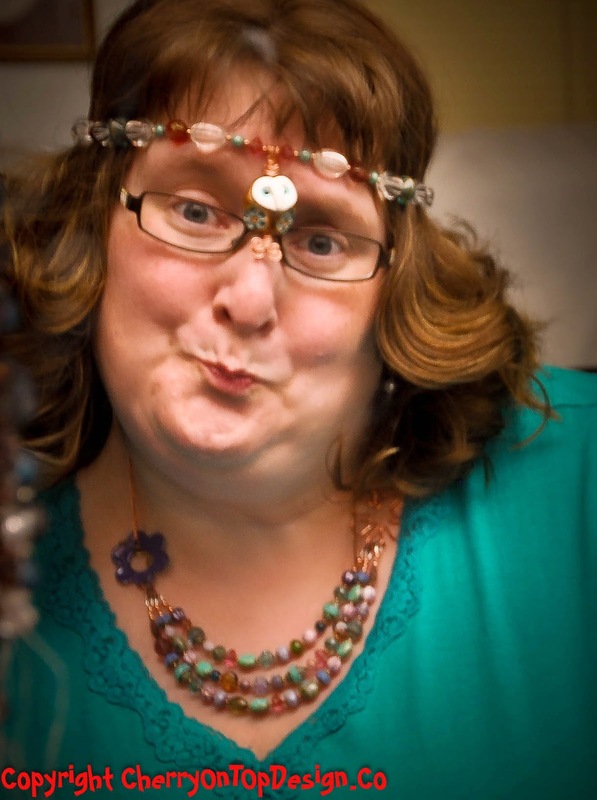 I love the selfie with the owl necklace headband. Excellent use of the soup. Now I'm off to Lisa's site to see what she made from the vibrant and oh-so-lovely soup you sent her. Great of your soup. I love the owl focal. The necklace you made with the clasp is fantastic. The soup was lovely and I love your pieces! The owl necklace is so sweet. I love all your pieces, especially the flower connectors you've made with wire - they're awesome. Hahahahahaha. LOVE the selfies. Great pieces....love the flower accents. Bellisimo! Love Owlivia! So cute. The earrings are darling. You rock, as usual. Love the selfies! 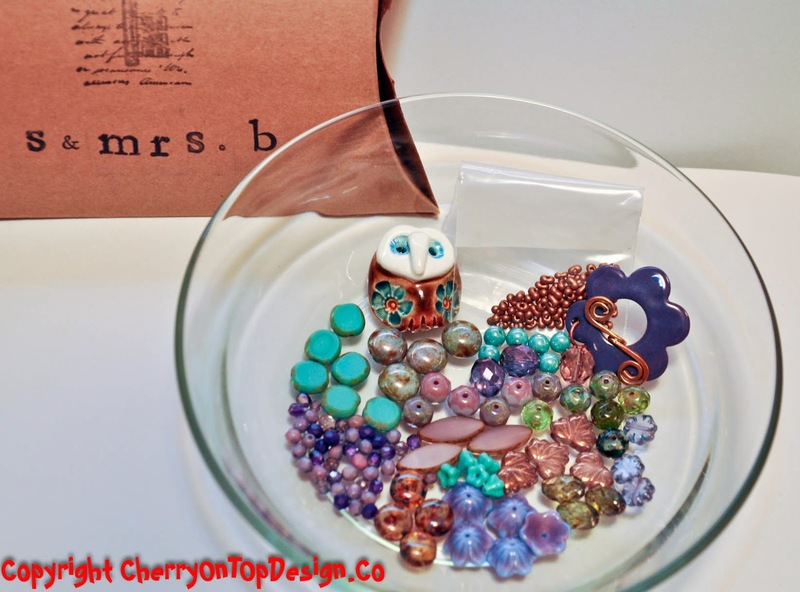 Awesome job on the three strand and love how you wire wrapped the owl bead. 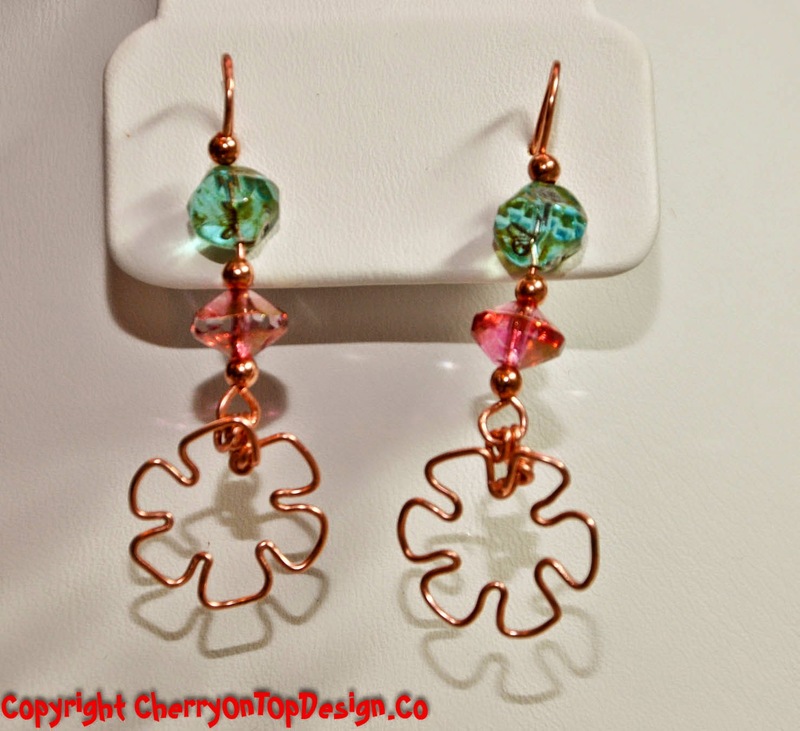 Not to mention the cool flower copper connector & copper flower earrings. Great job all around. Cute, cute, cute! Love all the designs....and the creativity of your photographs too! 2 beautiful necklaces and pairs of earrings......great use of your bead soup. Your wire wrapping on Owlivia is a-one! and your copper wire connector is a perfect balance to the flower clasp. Great job! Very creative! you did a good job with your soup! Hahaha your selfies put a big smile on my face!! It is lovely to see your designs on a real person!! Fantastic!! Lovely job! What a great soup, and I particularly like the flower clasp piece with your wire-work flower. Omg.. I love that owl necklace. That pendant is adorable. Beautiful pieces, I love Owlivia! Yes, yes, love what you did with the littles and the owl necklace and earrings are wonderful, great job! Lovely pieces. I love the spirals of wire below the owl, it adds great detail. Just getting around to more hopping now. Like your multi strand necklace. Not always easy to pull off, but you nailed it. Also the earrings are sweet. You look great modeling as well. BTW insightful write up about hopping to all the blogs. Love what you did with your soup. Like the first necklace and love the little owl. Oh, such beautiful pieces! The multi strand necklace is absolutely stunning. I really loved your pieces, the tiered necklace is great, I love the wirework mimicking the flower. I really like the wirework flower earrings. I really like your pictures as well, how much fun that is!! Great job!!! Your soup is delish! I love Owlivia! The wiring wrapping suits her very nicely! Your selfies are adorable! Lovely work. I enjoyed reading your blog! Thank you for entertaining me!! I just love that multiple strand necklace. It's gorgeous!